I know that conventional wisdom suggests that we should shun the sun. It’s bad for us, it can give us skin cancer. However, the sun gives us life. Life on earth would not exist but for the sun. The Incas and other civilisations worshiped the sun and with good reason. They recognised that the sun was life. Where am I going with all of this? Well to put it frankly, the sun makes one feel good and I for one will not cover up and cower in the shadows. I can’t take heat, heat is not good for my MS however, here in the Canary Islands, in early March with a constant cooling breeze, I can enjoy the sun and enjoying is what I’ve been doing. This mega dose of ‘feel good’ is just what I needed. I can recommend it to anyone. Having seriously depleted vitamin D levels after a dire winter in the UK, I can safely say, I’m now nicely topped up. 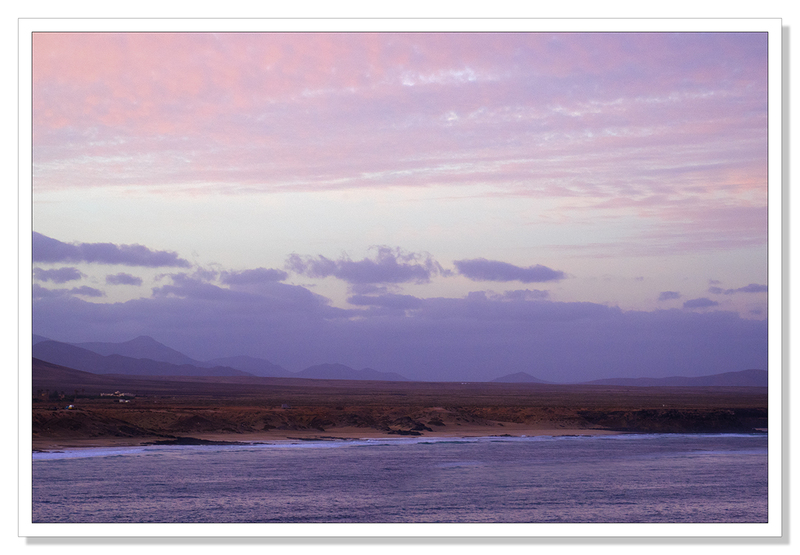 This picture was taken at dawn this morning from the small fishing village of El Cotillo, looking south along the coast to the mountains, the extinct volcanoes that form the back bone of these islands. This entry was posted on March 12, 2016 by Chillbrook. It was filed under Photography, Photography and Travel and was tagged with Adrian Theze, Cornwall Photographic, Dawn Mountains, El cotillo, Fuerteventura, Landscape Photography, Sony A7R, Sun, Sunshine, Volcanoes. Such soft, lovely morning light, Adrian. Beautiful. Beautiful colors – I’m glad you’re enjoying the sun. L.A. was like that a few weeks ago, too – lots of sun but not hot. One thing someone reminded me about March though, is that we do have much more light than in the months just past, and even up here in Seattle, I’m enjoying that so much these days. Oh sweet sun, how I miss thee. How wonderful that you get to enjoy so much of it, without blistering. Why may I ask, are you blogging on your vacation?!? Do you miss us sooo much, because I’m sure we’d love to come visit where you are!! This photo is just giving me such a good feeling. Enjoy your sunny break and go back refreshed in body, mind and spirit, Adrian. Hopefully this summer coming will be a good one for the British Isles and you see more sunshine from Cornwell. A serene and peaceful image. Thank you Lee. It would be lovely to think we might actually get a summer this year in the UK. It has been so poor the last four or five years. This trip has really brought it home how we miss the sun when the summers are so grey and wet. One of the reasons I could never live in the UK. Absolutely stunning shot! I just love the bands of pink and purple – makes for a very harmonious composition. And I do love the sun and not the heat so Canary islands in March sounds a good travel destination. Good for you, Adrian….soak it up! Beautiful image, too…..
What beautiful colors captured ! It’s good for us to get sun! Just not too much. Our ozone layer is so thin that now we can burn so easily from the bad rays. Lovely image. I really like the color. The extinct volcanoes look magnificent in the early morning light, Adrian. Good to hear your vitamin D levels are restored, winter in the UK has been dreary. I’m pleased to say the weather has improved in recent weeks here in the Lakes. Great to hear that you enjoyed your stay! I agree with you on the points you made about the sun, we are designed to need it, so where would we be without it. I love the colours in your photo, (not that I ever don’t), dawn is the best time of day in my books, with everything so calm and peaceful, and the young day itself still waking up, so much to see, and so little time to do it in before it all gets overtaken by the daily hussle and bussle. But that brief moment, when you get to enjoy it, is enough to put a smile on your face and carry you through the rest of the day. Nothing like sun for internal health and well-being—as well as for photos. I love the colours the sunset has created in this photos, without the sun visible. Enjoy the perfect warmth in the Canary Islands!